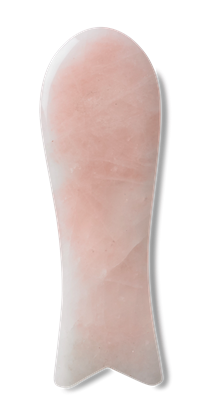 This rose quartz stone originates from Brazil, where the finest crystals of the highest quality are to be found. The rose quartz is called the love stone and stands for love, forgiveness, peace and harmony. It has a neutralizing effect on harmful rays (computer) and bad vibration. It strengthens our heart center. 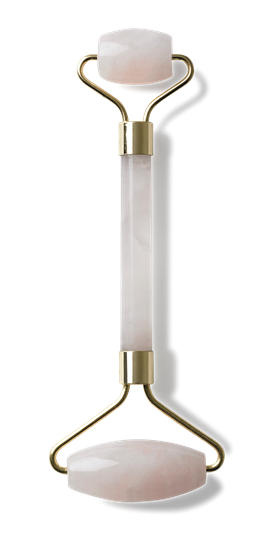 The rose quartz face roller is used to stimulate the microcirculation and the muscular face and for facial acupressure and lymphatic drainage. It is a form of facial exercise that can also be used preventive. When you strengthen the microcirculation in the skin, you strengthen your cell tissue and after a while you will feel and see the firming effect. Your skin will also start glowing more because of the increased blood flow. The stone is cold and has a calming effect on the nervous system, but if you need a quick up before going out the door, put it in the fridge before use. Use it both morning and evening on a clean face. Using the face roller after applying your serum or facial oil will help the product absorbing better. Roll for approx. 5-10 min. including the neck. The small end of the roll is perfect for the eye area and around the lips. Clean the face roller with a damp cloth.